Currently, when driving in Georgia, you'll only encounter one toll road in the whole state. Georgia 400, which runs from the Downtown Connector into Northwest Georgia, has one toll which will cost you 50 cents each way. The toll is between exit 1 and exit 2, just north of Downtown Atlanta and south of Buckhead/Lenox Road. The new I-85 Express Lane is currently under development in north metro Atlanta near Spaghetti Junction. These special toll lanes will have a variable price, depending on demand, and allow passengers to skip traffic by paying a fee. The 16-mile stretch will run both north and south. The cost can vary quite a bit, from 60 cents up to $6. It is estimated that most trips will cost less than $5. Using this lane is completely optional. 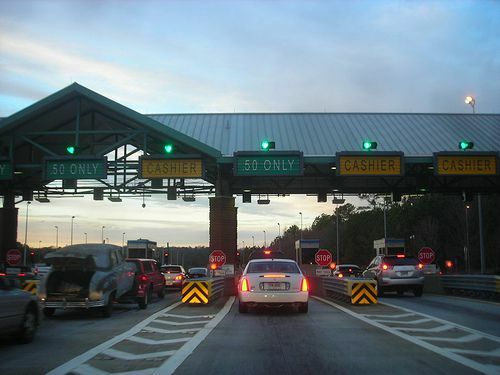 Those using the regular lanes will not have to pay a toll. The toll is paid using a Peach Pass (Cruise Card), so you don't have to stop at a toll booth. If you travel this way frequently and want to save time, you should set up a Peach Pass (Cruise Card) account so that you don't have to stop at the toll booth on Georgia 400 and can use the I-85 Express Lanes when they open. The Peach Pass is ties to a credit card and keeps your account stocked with a minimum of $20 at all times so that you can pass right through the toll. Watch a short video from the State Road and Tollway Authority to learn more about the new I-85 express lanes.